Alpine ski racing is an action-packed sport that mixes speed, agility, balance, coordination and tactics into some of the Olympic Winter Games’ most popular events. The sport emanates from the winter recreational activity of downhill skiing that provides skiers of all ages with a lifelong family pastime. The sport consists of four primary events: downhill, super G, giant slalom and slalom, plus the combined or super-combined that matches downhill and slalom into one event. Athletes get started in alpine ski racing by learning to ski at a local resort and taking ski school lessons to learn basic skills. Recreational racing programs like NASTAR provide a great platform for introduction to alpine ski racing. Local USSA Clubs are the primary starting point for aspiring athletes, providing an introduction point with knowledgeable coaches and officials to guide them along the development pipeline. The USSA provides education and support to its local clubs including a certification process for coaches, judges and officials and the club itself to ensure the best experience possible for athletes and parents. 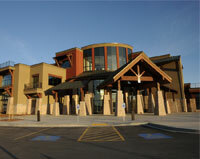 The Center of Excellence in Park City, UT, is a national training and education center providing world-class facilities and educational resources for the USSA's athletes, coaches, clubs and others.